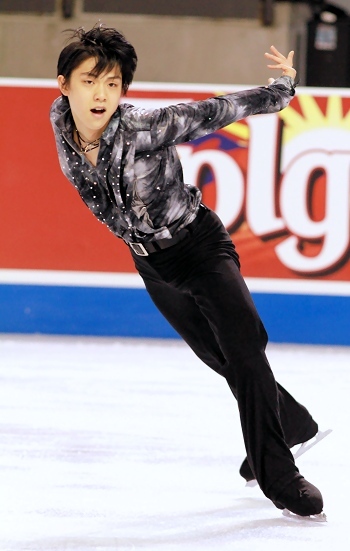 Japan’s Yuzuru Hanyu broke the record for the Men’s Short Program score with 95.07 points at 2012 Skate America. It was one of the strongest men’s short program competitions in recent memory in Kent, Wash., Friday night at 2012 Skate America. Yuzuru Hanyu, the phenom from Sendai, Japan, stole the show with an impeccable performance that earned the highest score for a short program in history—95.07 points. Hanyu was flawless throughout his Parisienne Walkways performance, opening with an easy quadruple toe loop that earned a whopping 12.30 points. The reigning World bronze medalist saved his other two jumping passes—an effortless triple Axel and a triple Lutz-triple toe loop for the second half of the program. Hanyu’s program was chock full of choreographic nuances which he executed with flair and excitement. As a result, the leader was also rewarded with the highest program component scores of the night (51.71/43.36). Hanyu has a nearly 10-point lead over teammate and former World silver medalist, Takahiko Kozuka. The 23-year-old skated a refined program to the Concert Overture from Exodus, earning a personal best of 85.32 (45.57/39.75) points. Kozuka earned high marks on all of his jumping passes, and like Hanyu, took advantage of earning a bonus for placing his last two passes after the midway point of his program. The lone mistake was an unsteady landing on his opening quadruple toe loop that cost him just .71 points. Standing in third place is USA’s Jeremy Abbott, who earned 77.71 (37.81/40.90) points with his “Spy” program. Abbott opened with a fall on a quadruple toe loop attempt, but regrouped to nail the rest of the elements in the program, including a textbook triple Axel and a strong triple Lutz-triple toe loop combination. Finishing in fourth was Japan’s Tatsuki Machida, who did not attempt a quadruple jump. The former Four Continents silver medalist skated clean with a crowd-pleasing performance to C2C’s F.U.Y.A. that featured a strong triple Axel and triple-triple combination. He earned 75.78 (38.65/37.13) points. Former Russian champion Konstantin Menshov, 29, finished in fifth place, and landed the only quadruple-triple combination of the competition. A fall on an triple Lutz attempt was the lone mistake in his program that scored 73.32 (39.72/34.60) points. Last year’s champion, Michal Brezina from the Czech Republic, had two falls and finished in sixth place (69.26). USA’s Armin Mahbanoozadeh also suffered a fall to finish seventh (68.27). The 21-year-old, who replaced Evan Lysacek, sprained his ankle during on Thursday during practice. Sweden’s Alexander Majorov came in eighth, followed by Tomas Verner of the Czech Republic and USA’s Douglas Razzano. Tessa Virtue and Scott Moir of Canada are the first North American ice dancers to win the Olympic gold medal (2010). They won gold again at the 2018 Olympics. They are also the first Canadian ice dancers to win the ISU World Junior Championships (in 2006). More on Tessa Virtue and Scott Moir from Golden Skate.